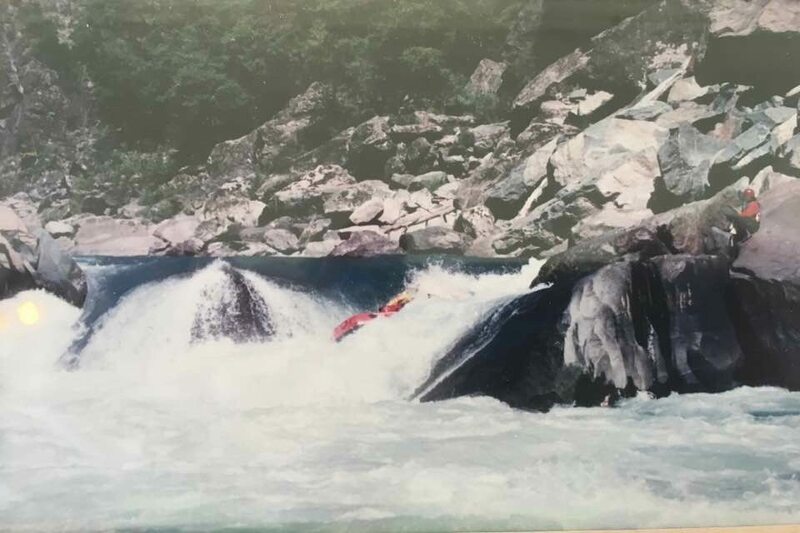 LEGENDS FROM A LOST RIVER: THE BIO BIO ~Part 3 by Taz Riggs | DBP MAGAZINE ONLINE The World's Best Free Whitewater Publication. 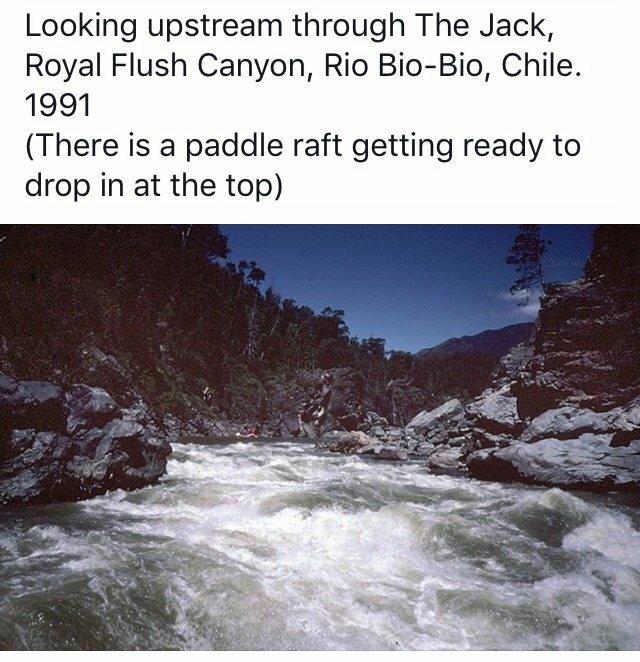 EDITOR’S DESK: Associate Editor Taz Riggs takes us back in time to the Chilean classic in part 3 of our monthly series on the Bio-Bio River. Enjoy! When I first came to the Bio-Bio, I considered the river to be within a wilderness. By first aid and rescue terms, we were more than two hours from medical care, even from the takeout point. 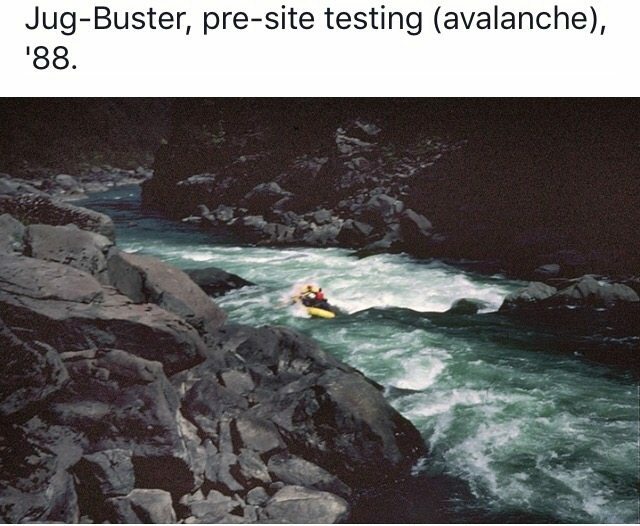 In our earliest days we may have been as much as two days out depending on the location on the river. To be sure, it was a rugged and isolated landscape. Leaving the Pan-American highway and driving up through the Pacific Coast Range, the road was was steep and wound it’s way through rough forests watered by moisture from the coast. There were small farms and lush resorts hugging thermal springs. Near the top of the climb it seemed the road would end where we encountered a steep and razor like ridge, too steep for the road to continue. In the late 1800’s engineers had bored a hole through the mountain, 4.2 kilometers, with manual labor to lay a single line of rails to accommodate a train. Here we would wait, sometimes more than a half hour, for traffic to exit the tunnel, coming out the other direction straight as an arrow. You could soon see an almost microscopic pin prick of light ahead, so small you might think it your imagination. The glow of the headlamps seemed to evaporate just in front of us in the blackness of the tunnel. The walls would drip, drizzle and douse us occasionally, as if it wanted to knock out our lights. The trucks and bus would sway and rock and sometimes take a jolt now and then, making you tense and staying braced while hoping you didn’t hit the sides, which seemed less than an arm’s length away on either side of the vehicles. The small speck of light never seemed to grow. That and the perfect darkness gave the impression that we weren’t actually moving forward, but being bumped and rocked back and forth by an unseen and powerful force. The passage always made me kind of nervous. The only consolation was that it had been in existence for more than two hundred years. After more than a half hour of the brain and eyes searching desperately for any scrap of light outside the vehicles, the relief of exiting was quickly replaced by sharp pain when coming back into the sunlight. The ache would last for ten or fifteen minutes until you had readjusted. When you were finally able to look around the first thing you would notice was the stark contrast in landscape between this side and the other of the range of mountains. Almost as different as the darkness of the tunnel and the light outside of it, the moist and green forest became a high mountain desert in the valley of the river at this altitude. A ribbon of green out in the center of the valley wound it’s way back to the source; two glacial moraines, natural lakes formed by retreating glaciers leaving the rock, gravel and silt that had been rolled and compressed under the weight of the ice, acting as a natural dam to seep it water as the birth of a river. The valley and the small town that was in it was known as Lonquimay, after a nearby volcano and a tributary to the Bio in the area. In 1990 the Volcan Lonquimay blew steam and ash, melting its ice cap and sending torrents of mud and water downstream. This in turn added an air of necessity to the proposed hydro projects. Chile’s geology is both volcanic and tectonic. Evidence of the active building of the Andes is everywhere throughout the country: jagged spires of rock thrust thousands of feet into the air from their base; snow-capped volcanoes dot the mountain range for its 3,500 mile length. Some are extinct, some are dormant, others are simply inactive and more than a few erupt from time to time. Earthquakes and tremors are common. The cinders, ash, dust and silt that blanket the country, make it a powerful agricultural exporter on the world stage. At the far end of the valley the river begins to carve it’s way through mountains. 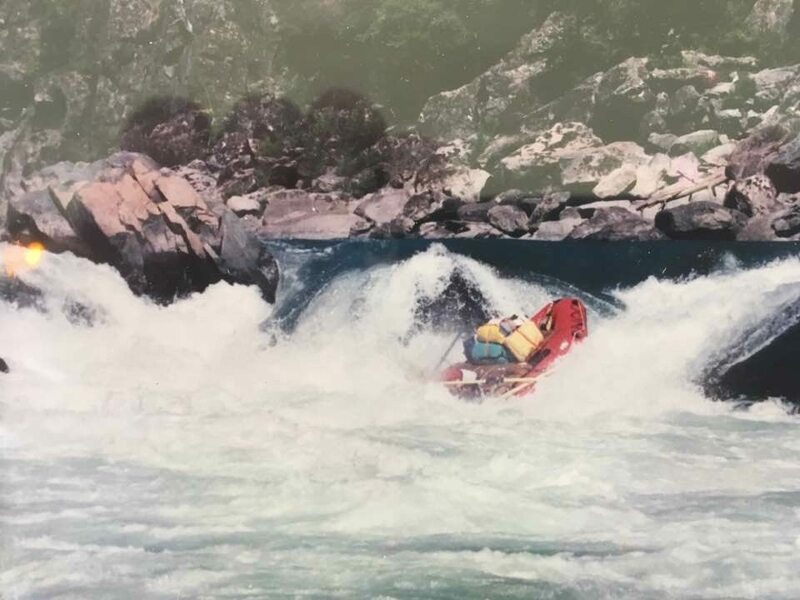 At the put in the river was not more than 50′ wide with a flow around 600-1000cfs. Our first couple of days were easy Class II-III, allowing time to adjust the load on the oar-rigs, establish a loading and unloading and camp routine. Moving downstream the vegetation, gradient and tributaries increased along with the volume of water. Our third night’s camp offered the first full view of the Volcan Callaqui (kayaky), Mother of every rock in the river and the source of the majority of the water from its permanent ice cap melting in the spring and summer, the rains that fall in late winter and spring and run down her shoulders. Sunsets were usually pretty spectacular. Though we couldn’t see the horizon to the west, the show was reflected from the snow draped over the summit. Callaqui is dormant, and though there has not been an eruption in recorded history, there is a vent near the summit that releases sulfur gas, staining the snow around the area a vibrant yellow. (Not to mention painting the air with the stench of warm rotted eggs). From this camp downstream, the river begins to hint at it’s reputation. The volume has increased three fold, tributaries have become more frequent and larger, dumping rocks and boulders into the river, especially along the right side of the river, where the volcano lives. 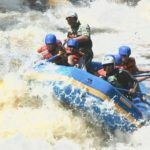 Rapids begin to offer technical challenges, moving around rocks and taking boat wide slots. The current begins to take advantage of those that aren’t planning and executing their maneuvers. Simultaneously, shear cliffs begin to rise and crowd the river as the gradient increases and the water takes on determined strength. Medicine Box, Jug-Buster, Milky Way, Lost Yak, Lava South, Cyclops and Last Laugh; all rapid names that suggest the severity, impact and duration of their character. This is the Nirrecco Canyon. At about two kilometers or five miles long, this is the first set of formidable rapids. We need to be up and on the water as early as possible, this short stretch would be a long day. More than half the day would be spent on shore scouting each rapid between Jug-Buster and Cyclops. The mileage on foot easily exceeded the water miles: climbing over and around boulders smooth as pebbles on a beach, but the size of cars and trucks; staining your eyes to see clearly in glaring sunlight; training the mind and body to recall landmarks, routes, alternate routes. 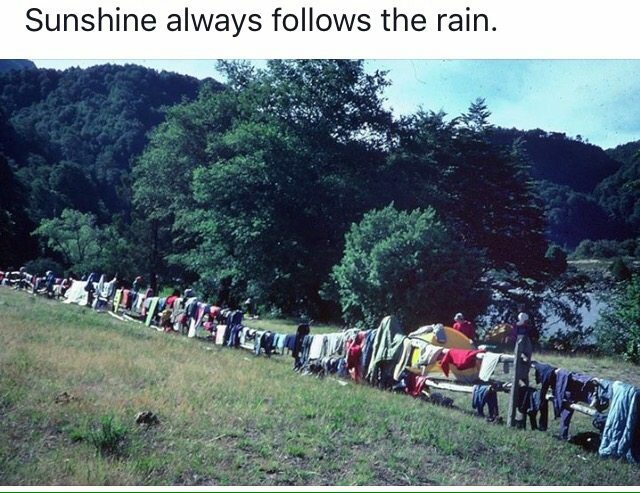 Sometimes, nothing looked the same when you got out there. Then other times you go, “Well…that worked.” I knew the river very well. 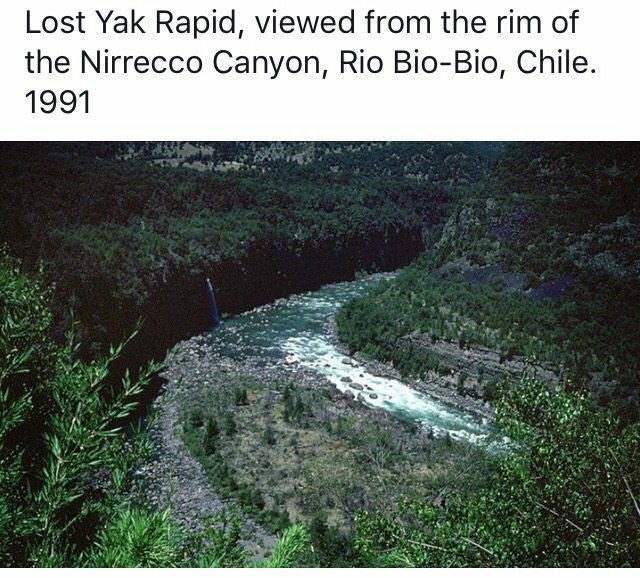 For that reason, I would have never dreamed of running any of those rapids without looking at them carefully first. From one year to the next, house sizes rocks could get up and move (I have photographic evidence). In one season falling water levels would reveal a new route that was never necessary in the past and is now, suddenly, the only option available. 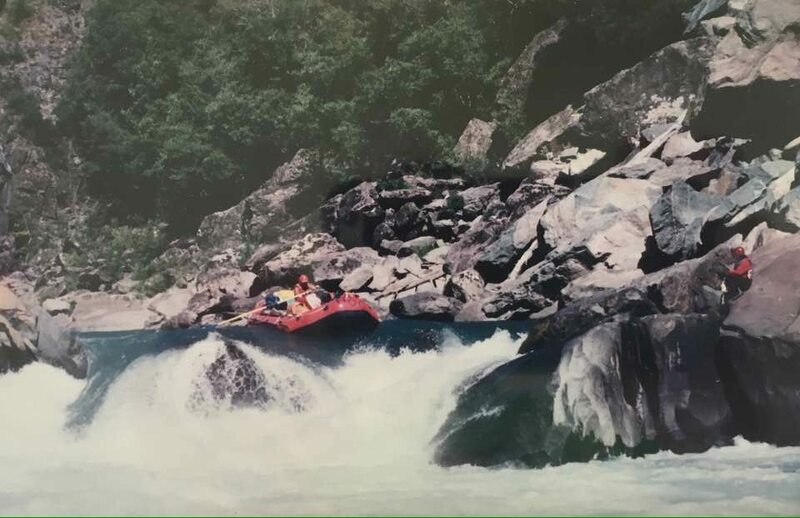 It was always understood that a mishap in one rapid could quickly carry on into the next, with or without its driver, rightside-up or upside-down. The Nirrecco could destroy both gear and people. I knew from experience that there was never a need to suspect embellishments in the stories I would hear. There was never a need to make things bigger than they actually were. I’d felt hopelessly lost in Milky Way more than a couple of times. 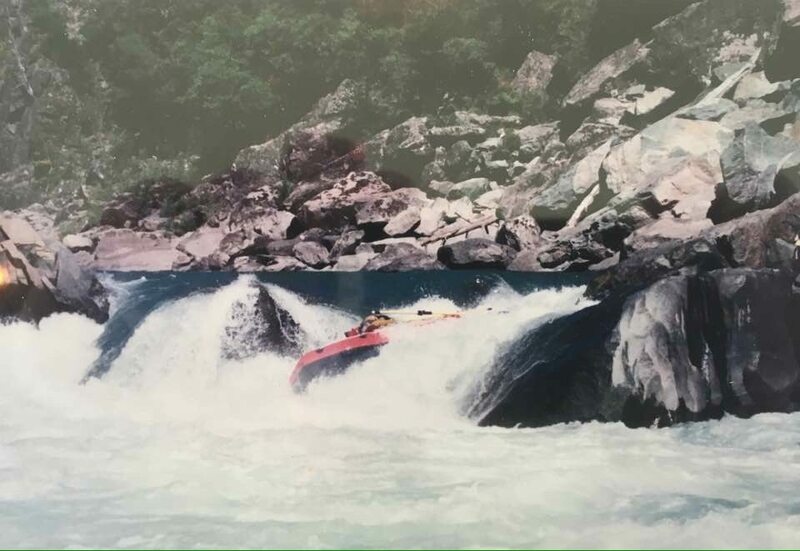 I’d flipped a heavily loaded gear boat on trips back-to-back in Lost Yak, the second time shattering an oar-frame made from two by twelve lumber, right at the spot where I had been laid out high-siding just a split second before it slammed into the rock forming the chute. First trip of the season one year, I missed the scouting eddy for Lava South. Piled high with gear and focused on the big red boulder I was to come around, I dropped into a hole that fit the raft like a shoe. Pretty smooth surf, but now my bucket boat was to my knees with water. Too heavy to control where I was going, I slammed bow first into the rock I was to go around, and the recoil pushed me out of range for any assistance with a rope. I could see a fellow boatman slowly wave goodbye from behind the rock, his throw-bag hung still in his other hand. Then, he took off running downstream so that he didn’t miss the show. I thought I would cry right there. All I could do was whimper for mercy and pull so hard I was sure the oars would break as they bowed to an impossible arc at the edge of my vision. The best I could do was maintain and repair my angle. In a self-bailer the story would have been very different. Whenever people talk about being one with a river, I always think of that run. 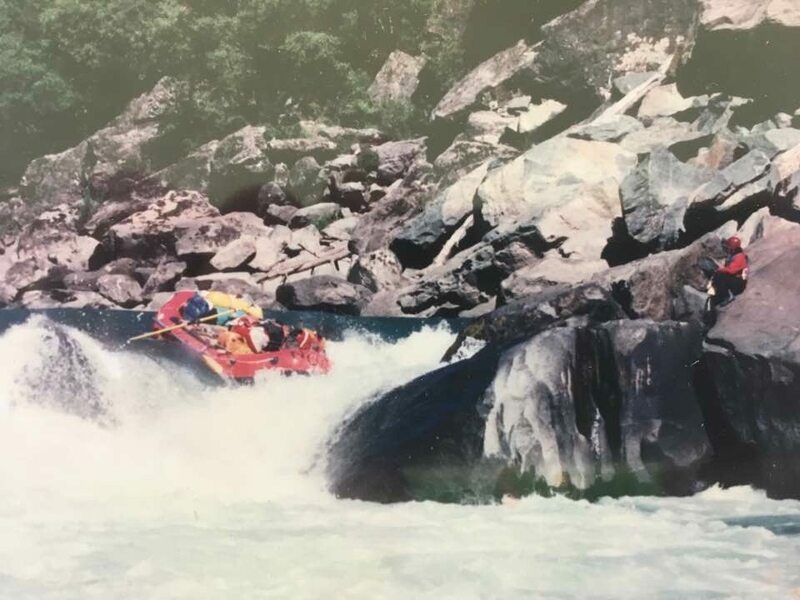 The bloated belly of that boat was drug through that rapid along what we called Ruta-Cinco, the Pan-American Highway in Chile was also the plan A line through Lava South. Sometimes a river knows where to go and it will take you along.